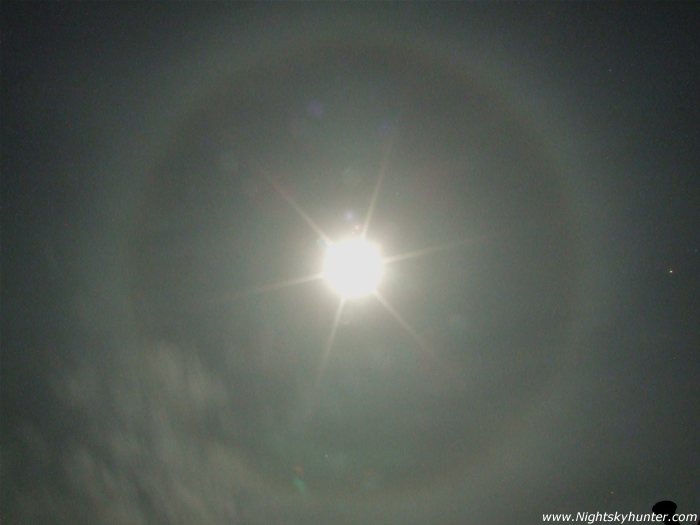 Beautiful complete 22 degree moon halo imaged on January 21/22nd 2008 from Willow Glynn, Maghera. First spotted at 01.00 UT and remained visible at various intensities throughout the rest of the night. I observed it until 03.00 UT. Took this image from my back garden while talking to a friend over the phone at the same time. This halo was caused by moonlight refracting off tiny ice crystals within a thick blanket of high level cirrostratus cloud. The colours were very easy with the naked eye. That's my rooftop to the bottom right with Mars above. 25 second exposure at ISO400 at F/7 using a 28mm lens.